When somebody says ‘’paradise’’ Bahamas is usually the first place that comes to many people’s mind. This coral-based archipelago is based in the Atlantic Ocean. This country consists of more than 700 islands. Most known Grand Bahama and Paradise are visited by many tourists and are home to some very high-end hotels. By terms GDP per capita, Bahamas is one of the richest countries in Americas. This jurisdiction is very known for a large number of offshore companies. Main economic activity in the country is undoubtedly tourism. Tourism is accountable for over than 60% of the country’s GDP and also provides jobs for more than a half workforce. After tourism, the next most important economic sector is banking and offshore international financial services. Government is encouraging foreign capital and is planning to do more reforms in order to improve this sector. Bahamas has a very favorable tax regime and is classified as tax heaven. There is no income, wealth, corporate and capital gains tax. Beautiful islands, crystal clear water, summer that never ends, developed banking and fact that it’s a tax heaven make Bahamas very appealing to foreign business people. This coral-based archipelago is very close to Florida, which is another reason to think about setting a residency here. In order to get a residency by investment, you need to buy property in the Bahamas. Real estate needs to be worth at least $500 000 BS (around $500 000 USD). This program also includes spouse and dependents of the main applicant, but in this case, he/she would need to prove the ability to provide enough funds to support a family in the Bahamas. Permanent residency is valid for life and gives the investor the ability to live and work in the country. The application procedure is made by the immigration department of Bahamas. After approval of the residence permit, the investor is required to obtain a home residence card in order to be eligible to buy the property. Non-refundable processing fee is 100 BS, endorsement of spouse and dependents is 25 BS and Permit fee is 10 000 BS. If you really want to go big with spending in Bahamas, there is an option of accelerated consideration of the application. This means your application will be processed faster than usual. What do you need to do? Well, if you want speedy residency you will need to purchase property of at least 1.5 million BS. Basically, you will be rewarded for buying a more expensive home. However, all this gives you only residency in the country. 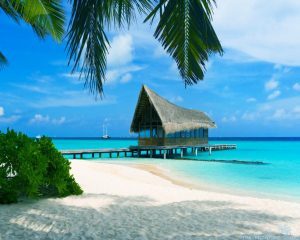 In order to get their citizenship and passport, you would need to live in this tropical heaven for at least 10 years.